Though the U.S. economy remains somewhat sluggish, an acceleration in third-quarter GDP is likely to provide the U.S. Federal Reserve with further impetus to raise rates in December. In what was investors’ first look at U.S. economic output during the latest quarter, the U.S. Commerce Department said GDP grew at an estimated pace of 2.9%, against expectations of 2.4%.10 The stronger-than-expected headline figure was, in part, due to a technical bounce in inventories, leaving the underlying consumption and investment trends more in line with the somewhat more tepid growth seen during the first half of 2016. Nevertheless, a rise in third-quarter GDP growth, coupled with ongoing improvement in the labor market and a modest increase in inflation expectations, has raised the odds of a December rate hike.11 Market-implied odds that the U.S. Fed will raise interest rates at its December meeting stood at 74% by week’s end, its highest level since immediately before the U.S. Fed’s December 2015 rate hike. Key factors influencing the direction of bond yields in the weeks ahead include any rhetoric coming out of next week’s Federal Open Market Committee policy-setting meeting, October’s payroll report and the result of the U.S. elections. Across the spectrum, corporate credit has benefited this year from generally stable economic conditions in the United States and ongoing accommodative monetary policies both at home and abroad. 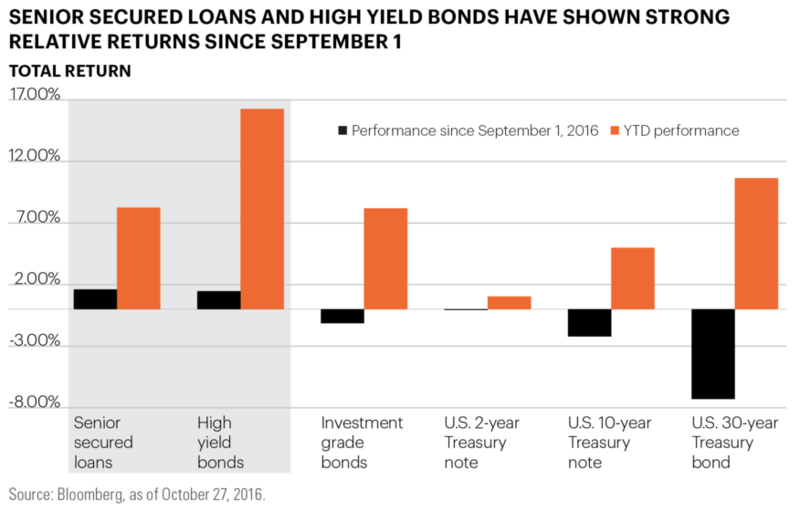 Returns on high yield bonds and senior secured loans in particular have been propelled by a strong rebound in the commodity sector. Since September 1, yields on 10-year Treasuries have risen approximately 28 basis points to 1.85%, while yields on 10-year German bunds have climbed roughly 23 basis points to 0.17%.5,6 Senior secured loans and high yield bonds have drawn significant interest within this environment, as investors have increasingly shown a preference for investments with very low or limited durations. 1 Bank of America Merrill Lynch U.S. Corporate Master Index. 2 Bank of America Merrill Lynch High Yield Master II Index. 3 Credit Suisse Leveraged Loan Index. 5 Federal Reserve Bank of St. Louis, http://bit.ly/2aAmG9p. 8 Federal Reserve Bank of St. Louis, http://bit.ly/2eZvbYa. 9 Federal Reserve Bank of St. Louis, https://fred.stlouisfed.org/series/DGS30. 10 U.S. Department of Commerce, http://bit.ly/1eZ44Hx. 11 Bloomberg, based on CME data. 12 Senior secured loans represented by the Credit Suisse Leveraged Loan Index; high yield bonds represented by the Bank of America Merrill Lynch High Yield U.S. Master II Index; investment grade bonds represented by the Bank of America Merrill Lynch U.S. Corporate Index.